After your wedding day, you will begin your new life together with your loving spouse, wonderful memories and your photographs. Over the years, those photographs will continue to refresh your memories of this special day. We have provided a number of helpful hints for selecting a wedding photographer. Following these guidelines will ensure that you choose a photographer who will contribute to the happiness of your wedding day and provide you with wonderful reminders of those cherished moments for years to come. After your decision to marry, choosing a photographer is probably the most important decision you will make. Take your time and choose thoughtfully. Most experienced photographers are booked 9  15 months in advance. Look at the work of the photographer who will photograph your wedding. 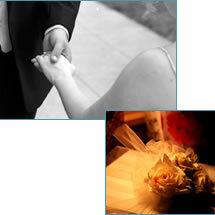 The two main styles of wedding photography are traditional and photojournalistic. Most photographers will specialize in one, but provide some amount of the other. When choosing, think about the style that you prefer, but also think about what types of photographs you would like to give your family and what you would like to show your children years from now. Make sure you are comfortable with the photographer. Photography is, by nature, an intrusive art. You will be spending a large amount of time in front of the camera on your wedding day and if you are not comfortable with the photographer it will show in your photographs. More importantly, your discomfort will detract from your happiness during your wedding day. Get the name of the photographer written into your contract. Once you have cultivated a relationship with your photographer, it is an unpleasant surprise to learn that someone else will be covering your wedding. Be sure the photographer is genuinely interested in photographing your wedding. For some photographers, a wedding is just another job. But photographers who specialize in weddings tend to have a passion for photographing people and therefore provide a better quality of service and finished product. Find out the studios policy on booking multiple weddings. Some studios, especially during the busy months, will book a photographer for more than one wedding per day. Ask the studio you are considering if they adhere to this policy. If they do, you must decide if you are comfortable with it. Booking multiple weddings in one day could make your photographer inflexible for any last minute change of plans. Ask if there are limitations to the number of hours the photographer will provide. Many photographers will limit the number of service hours they will provide. There are pros and cons to this approach. While you do only pay for the time you require, you may also run the risk the risk of rushing to get your images completed, having the photographer miss important images by leaving early or having to negotiate commercial arrangements on your wedding day. Understand your options and make sure you are comfortable with the determined length of service. Ask about the availability of Black & White coverage. The use of Black & White photography has regained widespread popularity. If you are interested in having some images photographed with Black & White film there are a few important questions you need to ask. First, ask to see samples of the photographers work. Also, ask if there are additional charges for the use of Black & White film. And finally, ask if the photographer uses Black & White film or simply converts color photographs. If you dont like any of the packages offered by a studio, ask if they will customize one for you. For the studios that offer specific packages, simply ask if you may customize a package to suit your needs. Most photographers will be happy to do this for you. Pay close attention to the terms of the contract. Some photographers require payment-in-full before they provide any wedding day services. Make sure you are comfortable with this arrangement. Ask about cancellation policies and satisfaction guarantees.